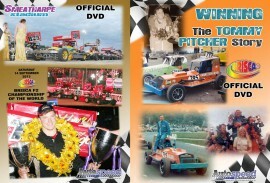 The Limited Edition set spans 40 years of BriSCA F2 Stock Car history. Disc one features a fascinating documentary from 1973, which centres on Tommy Pitcher, who won the World Championship that year, and also includes brief interviews with the likes of Roy Goodman and Bill Batten. Disc two features footage from 2013, at Smeatharpe, when James Rygor won the World Championship final, in the most dramatic race in the history of the event. The double DVD is poignantly priced at £7.95, and will be available from Neil Truran Motorsport, in the pit area at Smeatharpe as soon as gates open on Saturday 20 June onwards.